Studies show that In-Person Assisters, linked to community and religious organizations, were particularly effective in reaching minorities. Informing people about the affordable options available to them was the single most effective way to get uninsured consumers to enroll in coverage. The Affordable Care Act is working! On New Year's Day, 2014, millions of Americans began enjoying the benefits and peace of mind of having private health insurance. Regardless of financial resources or a pre-existing condition, everyone has access to good medical care. 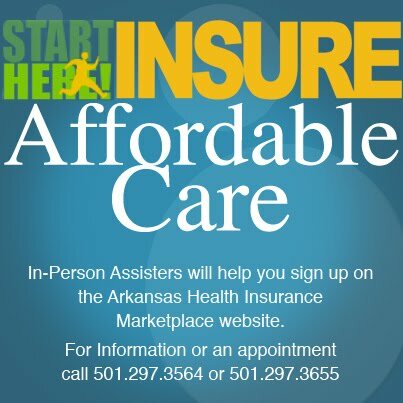 In Arkansas, most people qualify for financial subsidies that cover the cost of premiums and other medical expenses. September, 2014: We are entering another historic moment in a long road to gaining universal healthcare as a right. The second open enrollment period for the Health Insurance Marketplace starts November 1. There will be challenges. Many have seen their relatives, friends and neighbors get covered and see a doctor. So, we expect a rush of new enrollees as well as those who need to renew or change plans. Last year, consumers were assisted by over 3,000 In-Person Assisters and other federally-funded positions working for government and non-profit organizations at the community level. Arkansas' implementation of the Affordable Care Act became a model for the nation, and was ranked #1 of all states in reducing the number of uninsured individuals, families and children. In the last session, the Arkansas Legislature eliminated funding for any advertising outreach or personal assistance programs. They silenced the voices that had made the Arkansas plan so successful. This year, private foundations, Federal grants, hospitals and community health clinics will fund a much smaller number of licensed assisters to provide outreach, education and enrollment services. Future Builders, a non-profit guide organization in partnership with Arkansas Advocates for Children and Families, has received funding for its IPA program. We are here to help people in Central Arkansas and represent them in the Marketplace. We do not represent an insurance company or private interest. We give you the straight facts, so you can make the right decision.